DescriptionThe Copernicus Sentinel-1B satellite takes us over Semera in northeast Ethiopia. Semera is a new town with a population of just over 2600 and serves as the capital of the Afar region. The region spans an estimated 270 000 sq km, from close to the border with Eritrea towards the capital of Addis Ababa. We can see the regional capital in the top right of this false-colour image, with the larger urban centre of Dubti just south of the town. Both are found in the Great Rift Valley, which lies between the Ethiopian Plateau and the Somalia Plateau. The landscape of the Afar region is characterised by desert shrubland and volcanoes, particularly in the north. In this image we can see differences in altitude represented in the variations in colour. 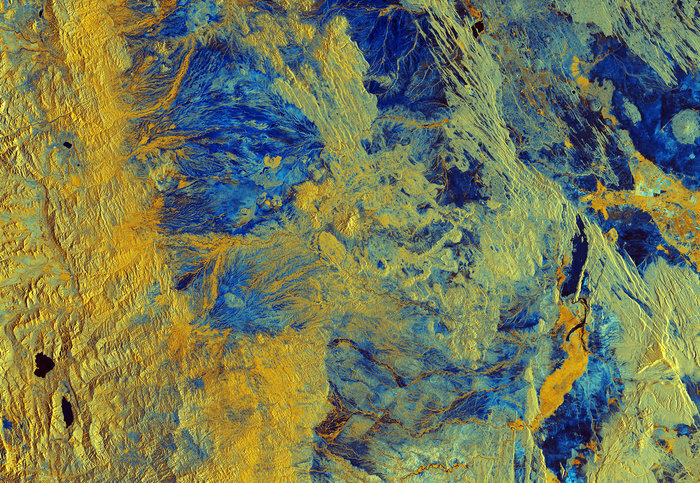 The left part of the image is dominated by yellow, signifying changes in vegetation found at higher altitudes. Two lakes, Hayk Lake and Hardibo Lake, are shown in the bottom left. South of Dubti we can see the Awash River, which flows into the northern salt lakes rather than into the sea. Salt trade is typical of the area, whilst cotton is grown in the Awash River valley. Maize, beans, papaya and bananas are also cultivated in the Afar region. It is thought that 90% of the region’s population lead a pastoral life, rearing animals such as camels, sheep and donkeys. Dallol, to the north of Semera in Ethiopia’s Danakil Depression, is frequently cited as one of the hottest inhabited places on Earth. Lying 125 m below sea level, with temperatures in the spectacular hydrothermal fields averaging 34.4 °C year-round, and the area receiving just 100–200 mm rainfall a year, conditions are thought to be amongst the most inhospitable in the world. Sentinel-1B was launched in April 2016, carrying an advanced radar instrument to provide an all-weather, day-and-night supply of imagery of Earth’s surface. Along with Sentinel-1A, which was launched in April 2014, the mission benefits numerous services, including monitoring land-surface for motion risks and mapping to support crisis situations. This image, which was captured on 5 April 2018, is also featured on the Earth from Space video programme.